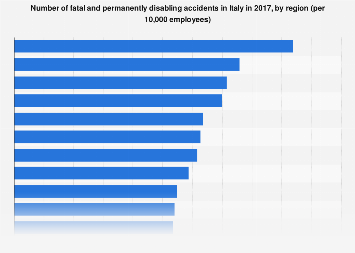 Bureau of Labor Statistics data published last month reveals that in 2017, the U.S. experienced 5,147 fatalities in the workplace, a slight decline on 2016's 5,190. 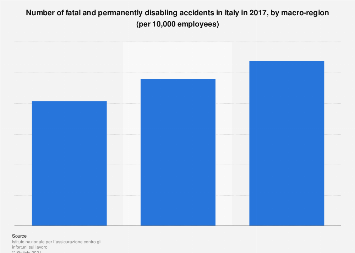 Likewise, the fatal injury rate fell from 3.6 per 100,000 full-time equivalent workers in 2016 to 3.5 in 2017. The most frequent fatal event was fatal accidents in the transportation sector and they accounted for 40 percent of total deaths. In 2017, the highest fatal work injury rate in the U.S. occurred in fishers and related fishing workers which had 99.8 deaths per 100,000 full-time workers. 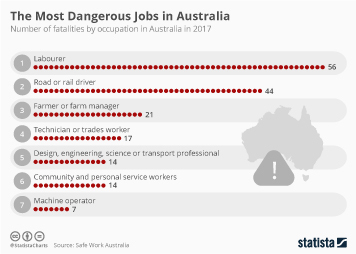 Logging and aircraft pilots/flight engineers came second and third with 84.3 and 48.6 deaths per 100,000 full-time workers respectively. This chart shows civilian occupations with the highest fatal work injury rate in 2017.